On integrated care teams, it is vital for social workers to identify, understand, and advocate for their role. Social workers have long fought for their seats at any number of tables. With a wide scope of practice knowledge and skills, they recognize—and have worked for others to recognize as well—that their abilities are valuable to an array of care teams. This is particularly true in health care—an ever-evolving field that is increasingly looking to include professionals outside of what may be thought of as the standard team. This is evident in the rising number of integrated care teams across the country. Primary care offices and other health care settings increasingly aim to include, among other professionals, behavioral health care workers on their teams. In fact, according to a study released in November 2018 from the University of Michigan School of Public Health Behavioral Health Workforce Research Center (HWRC), nearly 44% of primary care physicians are colocated with behavioral health providers. This means that they are not only on the same team but also physically in the same office. As integrated care continues to grow, social workers are tasked, yet again, with ensuring that they have a place on those teams and, even more, with identifying what that place means. To be most effective, social workers must enable themselves and their colleagues to recognize and understand the value of a social worker. Helping foster that understanding are numerous professionals and organizations throughout the country. They seek to learn more about what social workers (and other professionals) currently do in a variety of integrated health care settings and, as a result, what can be done to better utilize these practitioners. HRSA also created the Behavioral Health Workforce Education and Training (BHWET) program. This program helps colleges and universities train and develop the behavioral health workforce. Thanks in part to the existence of the HWRCs, researchers have been able to examine the role of social workers on integrated care teams through a variety of studies. One recent study in particular relied on BHWET participants to help pinpoint what social workers are doing and what more they might be able to do. • a pilot study similarly aimed at identifying social workers’ functions. This third step surveyed 395 MSW students and MSW field placement instructors, all of whom were a part of BHWET programs. The surveys looked to identify what social work–specific tasks the respondents were performing in their roles, as well as how the respondents felt as a part of the integrated care team. Of the 25 tasks named in the survey, respondents did an average of 15 weekly. These tasks included team-based care, motivational interviewing, warm hand-off, and medication management. Of note, however, was the fact that certain tasks didn’t seem to be well utilized. Erica L. Richman, PhD, MSW, a research analyst at the Program on Health Workforce Research and Policy at the Cecil G. Sheps Center for Health Services Research and adjunct clinical assistant professor in the School of Social Work at the University of North Carolina Chapel Hill, agrees. “One of the things I remember was that most of the people in health care or placed in health care settings learned most of what they had to do in their job on the job,” she says. However, even with the majority feeling valued, a significant portion (near 40%) did not, indicating room for improvement. Though this is just one study, its findings provide a foundation for social workers, as they work to better explain their roles on integrated care teams. The findings offer educators a better understanding of what social workers will be doing once they enter the field, and that, in turn, informs curriculum. However, there were gaps and, as Zerden pointed out, a slight disconnect between what was being taught in the classroom and what models were being applied in the field. 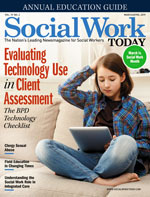 Additionally, Zerden, Lombardi, and Richman’s work illustrates that the tasks used by social workers do not align with what providers are able to bill for. While health care is moving toward a value-based model, most settings continue to rely on a fee-for-service model. If incoming social workers don’t understand what that means, they might not be able to bill for their services or demonstrate their financial value to the team. “In addition to being trained as direct practitioners, social workers also need to be thinking about and trained on aspects that are not direct practice—understanding billing, understanding how policy affects their job—and continued training. We need to make sure that we understand how other health disciplines are trained,” Lombardi says. This too has been incorporated into classrooms through the BHWET program, but more can be learned. Perhaps the best setting for that learning is in the field, with field instructors. If that is the case, MSW programs need to ensure that they have a cadre of field instructors able to provide not only direct practice supervision but also administrative instruction and guidance. Beyond informing educational next steps, the study sheds light on a general ambiguity surrounding team makeup. Social workers reported a significant level of role confusion. Per the study, “Only 38% reported the team had an in-depth understanding of each other’s roles and functions.” This indicates that all members of care teams need to have a better understanding of each other’s capabilities. Fortunately, programs such as the BHWET program help merge the silos through preparation and education, and there is evidence of increasing emphasis on understanding one’s future teammates. “Many schools now make sure that right off the bat, they start teaching about what the other health professions do,” Brandt says. This is something that has begun happening at the University of North Carolina, Zerden notes. In fact, she is involved in several interprofessional courses across the health affairs that now include MSW students. Such education is an important first step but it does not completely eliminate the likelihood of role confusion. Considerable overlap is possible among team members and that can lead to tension, which leads to a lesser quality of service. This is most evident for social workers in the care management role—a position that has traditionally been filled by nurses and/or social workers. Clarifying roles is in large part the responsibility of the team and will vary from setting to setting. It would be impossible to define each social worker’s role while they are still in the classroom, for example. However, once on an integrated care team, for social workers to be truly understood and best utilized, they must take on the onus of clarifying who they are and what they do. In doing so, they will still have to work within the parameters of their position, but the likelihood that their skill set will be best used increases. Of course, this is easier said than done. “It takes grit and tenacity, something common to social workers, to be able to say, ‘This is what I do, and you need my skills to help,’” Zerden says. It also takes know-how. Social workers need to know what they do. They must be able to not only describe their skills but name them as well. In “Toward a Better Understanding of Social Workers on Integrated Care Teams,” many respondents failed to recognize the tasks they perform weekly. Take, for example, problem-solving therapy. “Some of the people said, ‘No, I don’t do that.’ But they would describe what they do, and they do problem-solving therapy,” Richman says. It can be uncomfortable to do this, but it’s worth it. “When I was an MSW student, we went up to Sacramento for a lobby day activity, and we talked about title protection,” Zerden says. “I remember thinking this was a low priority. I wanted to talk about the people we were there to serve. “I’ve come so far from that. Title protection and being called a social worker is fundamental. You can’t care for someone else unless you are well and cared for yourself.” Similarly, you can’t be an effective and good social worker unless you can effectively advocate and support your profession. Education, clarification of roles, and advocacy for the profession and one’s skills are all key aspects of helping to identify a social worker’s role on an integrated care team—aspects that, in this instance, stemmed from one study. But that one study is not, as aforementioned, the first step in this process, nor is it the last. More research and dissemination of that research must be done as social workers become an increasingly present part of health care teams. And, much like health care teams, the research needs to be interprofessional. “You publish in your journals; you talk to yourselves. But that’s not unusual to social work,” says Brandt, who notes that most professions continue in their silos as they conduct and disseminate research. She emphasizes that scholarship across professions must occur for best results—just as in health care.